Cervinis Fiberglass Cowl Style Hood 08-up Dodge Challenger Fiberglass Cowl Style Hood 08-up Dodge Challenger, Cervini's 1193 Hood, Dodge Challenger Cowl Hood, Challenger Cowl Hood, Dodge Challenger Fiberglass Cowl Hood, Challenger Fiberglass Cowl Hood, Dodge Challenger Hood, Dodge Challenger Fiberglass Hood [Cervinis 1193 Challenger Hood] - $659.95 : 3rd Strike Performance, Your Source for Late Model MOPAR Performance Parts and Accessories! Finished underside liner adds extra strength and can be painted for a show quality appearance. Bolts on utilizing OEM Hood hinges, latch and hardware. Windshield washer squirters are relocated and hidden under the Hood. Highest point of Hood rise is 2-1/2". 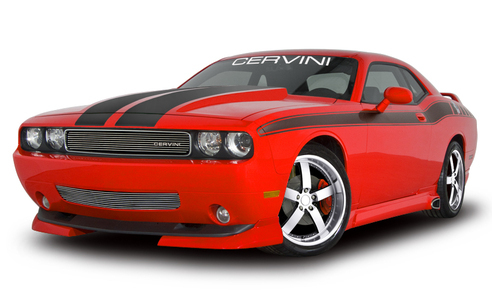 As with all Cervini's hoods the hood arrives ready to install with no cutting, drilling or trimming required. The hellcat style hood also features a fully finished underside, which is a must for any serious show car. Hand crafted right here at our New Jersey head quarters using only the best fiberglass and urethane materials. Pre-painting is also available for all 2008 through 2017 (2018 will be available soon) factory colors. Just select your year and paint code and your hood arrives ready to install the same day. Our paint quality and paint match are outstanding. Please enter your paint code in the text box. Note: Please select model year range when placing your order to receive the correct installation hardware. Note: Sanded, primed or altered parts are non-returnable. All hoods ship truck freight. Hoods are normally shipped to a business address or freight terminal. These are deliverable to a residential address for additional cost.